You need to click on the image to see it in more detail. Its a composite made by Autostitch, and shows a view of the part from our fence. The grass was last cut 6 weeks ago, and it needed a cut after all the rain. It's a pity the chopped down tree is still blocking a large patch of lawn on the left of the photo. 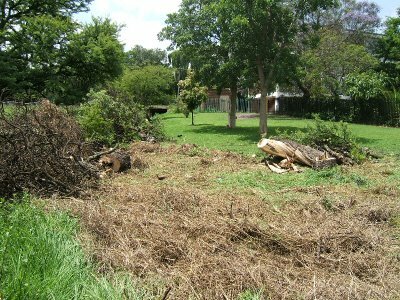 This picture shows the tree debris when it was cut down on 23rd November, about 2 months ago. The wood remains untouched and the foreground is totally overgrown.